Our Abpromise guarantee covers the use of ab200 in the following tested applications. WB 1/2000. Predicted molecular weight: 162 kDa. Multifunctional enzyme that has both magnesium and ATP-dependent DNA-helicase activity and 3'->5' exonuclease activity towards double-stranded DNA with a 5'-overhang. Has no nuclease activity towards single-stranded DNA or blunt-ended double-stranded DNA. Binds preferentially to DNA substrates containing alternate secondary structures, such as replication forks and Holliday junctions. May play an important role in the dissociation of joint DNA molecules that can arise as products of homologous recombination, at stalled replication forks or during DNA repair. Alleviates stalling of DNA polymerases at the site of DNA lesions. Important for genomic integrity. Plays a role in the formation of DNA replication focal centers; stably associates with foci elements generating binding sites for RP-A. Defects in WRN are a cause of Werner syndrome (WRN) [MIM:277700]. WRN is a rare autosomal recessive progeroid syndrome characterized by the premature onset of multiple age-related disorders, including atherosclerosis, cancer, non-insulin-dependent diabetes mellitus, ocular cataracts and osteoporosis. The major cause of death, at a median age of 47, is myocardial infarction. Currently all known WS mutations produces prematurely terminated proteins. Defects in WRN may be a cause of colorectal cancer (CRC) [MIM:114500]. Blocked using LI-COR® Odyssey® Blocking Buffer for 45 minutes at room temperature. Primary antibody dilution buffer: Blocker 1:1 in PBS + 0.1% Tween. ab200 (1/1000) staining Werner's syndrome helicase WRN in HeLa cells (green). Cells were fixed in methanol, permeabilized with 0.5% Triton X100/ PBS and counterstained with DAPI in order to highlight the nucleus (red). 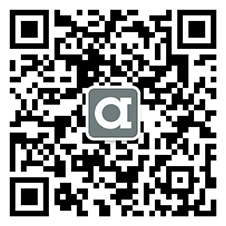 Please refer to abreview for further experimental details. ab200 (4µg/ml) staining Werner's syndrome helicase WRN in human colon using an automated system (DAKO Autostainer Plus). Using this protocol there is nuclear and some cytoplasmic staining. We tried both antibodies again. 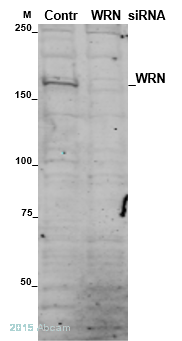 WRN-ab 17987 did not recognize any protein band with all the controls.The BLM-ab2179 simply recognized a whole lot of proteins--so we just cannot tell which of these would be specific for BLM. I think is best to provide a credit as we will soon need to order anti-histone antibodies. Your credit note ID is ********. I am sorry that these antibodies did not perform as stated on the datasheet. I have asked our accounting department to issue a credit note for you, which can be redeemed against the invoice of a future order by passing it on to your purchasing department. To avoid confusion, please ensure your accounts department is aware of how the credit note is being used. If you have questions on how to use the credit note, please contact our accounting department.
. Please send WRN ab17987 and BLM ab2179. There will be a delay in you receiving these antibodies as ab2179 is currently out of stock, but it is due to come in on June 11th and we will hopefully send it to you the same day. I am sorry about the delay. Your new order number for tracking purposes is Order ************. 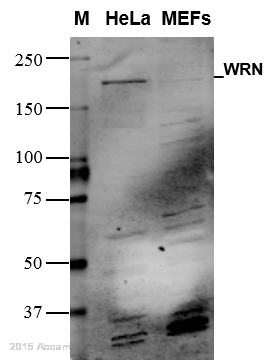 No signal in western blot, only high background. Please let me know which antibodies you would like as replacements and I will have them sent to you as soon as possible. An article about ab200, publicated in PNAS 2006, showed the results of immunohistochemistry (IHC) of WRN protein. But the method was not explained in the article, and IHC is not listed in your product catalogue. How can I get the method of IHC of Werner protein using ab200? Thank you for your enquiry. You are correct the publication that you refer to; Agrelo R et al. Epigenetic inactivation of the premature aging Werner syndrome gene in human cancer. Proc Natl Acad Sci U S A 103:8822-7 (2006). PubMed: 16723399 applied this antibody in cultured cell lines using immunofluorescence in addition to immunohistochemistry on Werner's syndrome mice. In the publication within the methods section they refer to references 22 and 30 for their methodology in these two applications; Ropero, S., Setien, F., Espada, J., Fraga, M. F., Herranz, M., Asp, J., Benassi, M. S., Franchi, A., Patino, A., Ward, L. S., et al. (2004) Hum. Mol. Genet. 13, 2753–2765. Chen, L., Lee, L., Kudlow, B. A., Dos Santos, H. G., Sletvold, O., Shafeghati, Y., Botha, E. G., Garg, A., Hanson, N. B., Martin, G. M., et al. (2003) Lancet 362, 440–445. Unfortunately these two pubclications do in fact refer to; BK Kennedy, DA Barbie, M Classon, N Dyson and E Harlow, Nuclear organization of DNA replication in primary mammalian cells, Genes Dev 14 (2000), pp. 2855–2868 in their methods section. However, I have examined this publication and this does not detail the approach used; whether frozen sections or paraffin embedded sections. Therefore unfortunately I cannot update this antibody datasheet to reflect the antibody's application in this publication. For details of the methods employed I would encourage you to contact them directly using the email address detailed on the publications. I hope this information helps, please do not hesitate to contact us if you need any more advice or information. Can you tell me the immunogen used to make this antibody? I would like to know if it can react with a truncated form of the protein I am studying. Thank you for your enquiry. The immunogen used to make this antibody was the N-terminus, amino acids 1-510, of the protein. I hope this information helps, please do not hesitate to contact us if you need any more advice or information. BATCH NUMBER 34820 DESCRIPTION OF THE PROBLEM also batch 79641. High background. SAMPLE HeLa whole cell extract PRIMARY ANTIBODY 1:500 ON at 4C in TBS SECONDARY ANTIBODY 1 hr at RT at 1:10000 in TBST DETECTION METHOD Supersignal POSITIVE AND NEGATIVE CONTROLS USED HeLa WCE No primary gave no background. TRANSFER AND BLOCKING CONDITIONS 7.5% polyacrylamide (37.5:1) Bis 30 min, 50 volts, transfer to PVDF membrane 5% NFDM in TBST HOW MANY TIMES HAVE YOU TRIED THE APPLICATION? numer HAVE YOU RUN A "NO PRIMARY" CONTROL? Yes WHAT STEPS HAVE YOU ALTERED? Primary at 1:500, 1:1000, 1:2000 Block in NFDM at 5% and 10% in TBST Block in 5% BSA in TBST ADDITIONAL NOTES Have used successflly in the past but the latest lots, 34820 and 79641, have had excessive background. Some suggestions reduced background but also reduced signal to unsatisfactory levels. Thank you for your enquiry and for taking your time to fill in the on-line questionnaire. We are very sorry to her that your customer is having problem with this antibody. Would you be so kind to provide further information about: 1. How much protein was loaded onto the gel? 2. What is the secondary antibody? In what species was it raised? We certainly can offer you a new vial free of charge. Please do let us know if your customer would like to test it. We look forward to hearing from you soon.